Essential for the aspiring comic or the working comedian interested in updating his or her comedy routine, Step by Step to Stand-Up Comedy is the most comprehensive and useful book ever written on the art of the stand-up comedian. Greg Dean examines the fundamentals of being funny and offers advice on a range of topics, including: writing creative joke material; rehearsing and performing routines; coping with stage fright; dealing with emcees who think they're funnier than you; getting experience; and lots more. 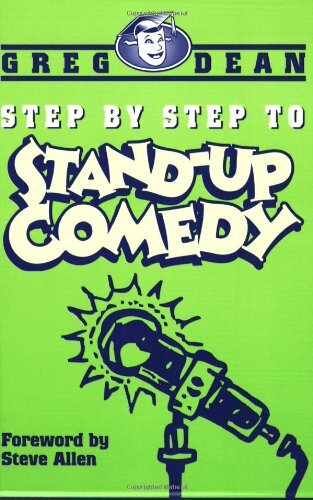 Essential for the aspiring comic or the working comedian interested in updating his or her comedy routine, "Step by Step to Stand-Up Comedy" is a comprehensive and useful book on the art of the stand-up comedian. GREG DEAN is a former Ringling Brothers and Barnum & Bailey Circus clown, a street performer, and a regular at the Comedy Store in Hollywood. Through his popular "Stand-Up Comedy Workshop" at the Santa Monica Playhouse, Dean has worked with many of todays top comics. He currently lives in Los Angeles, California.